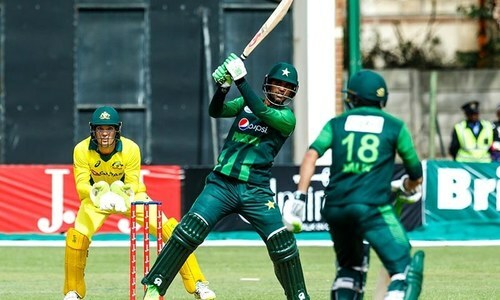 Records tumbled for Pakistan in Bulawayo, where the green shirts on Friday set a record-breaking 399-run target, beating Zimbabwe by 244 runs in the fourth match of their five-match One Day International (ODI) series. 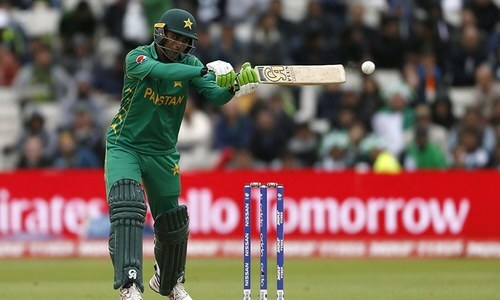 The green shirts' highest-ever total, which surpassed their previous record of 385 runs against Bangladesh, was bolstered by an impressive double ton by left-hander Fakhar Zaman, who today became the fifth-highest scorer in ODIs. His 210 not out also beat Saeed Anwar's previous 194-run record for Pakistan, set some 21 years ago. 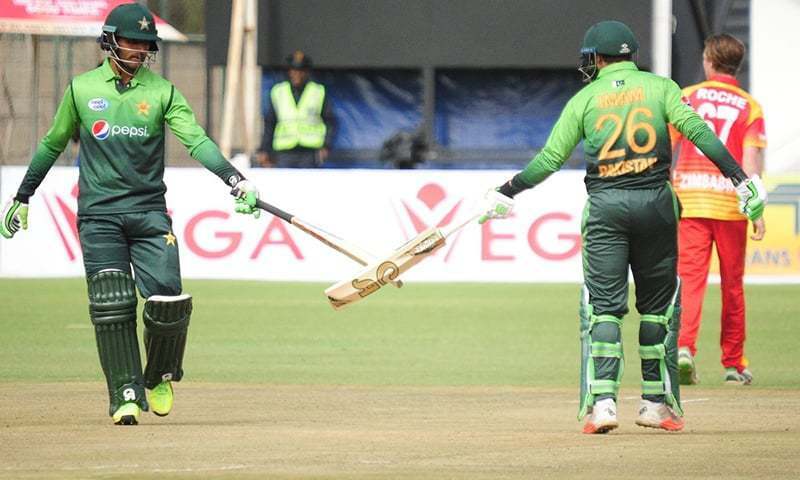 Fakhar and Imamul Haq also broke the record for Pakistan's highest ODI partnership for any wicket. The pair surpassed the previous record of 263 runs, set by Aamir Sohail and Inzamamul Haq against New Zealand in 1994. The two also broke the world record for the highest-ever opening stand — set by Sarnath Jamahiriyas and Pul Charanga for Sri Lanka against England at Headingley in 2006 — making 304 together before Haq departed. The hosts' innings was wrapped up in the 43rd over, with the team all out for 155 runs. Zimbabwe's 244-run defeat was their second heaviest in ODIs, and they avoided that calamity only through a 69-run sixth wicket stand between Elton Waggumbura and Donald Timpano. Shadab took four wickets in 8.4 overs, giving away only 28 runs. Imam ul Haq, Fakhar Zaman, Babar Azam, Shoaib Malik, Sarfraz Ahmed (c/w), Asif Ali, Faheem Ashraf, Shadab Khan, Yasir Shah, Junaid Khan, Usman Khan. Thats great! Congratulations to Pak XI and Fakhar Zaman! Bravo! Congratulations, fakhar for splendid double. You are one of the best among Pakistani players who play own hame with determination and for Pakistan. We miss Sharjeel khan as well . Love Pakistan from IOK. Congratulations Fakhar Zaman. Welcome to the Double Centurion club. Well done Fakhar. Finally an explosive and consistent player for Pakistan. Great knock! Proud of you Fakhar Zaman. Even though the opposition was weak, I would like to congratulate the team! What a humble guy.. well deserved.. Pakistan must give chance to Sahibzada Farhan in last match. This is Awesome, even though it was a weak team, it takes patience to generate this big partnership. Pakistan is looking good for next year world cup. They need to keep grooming this young lads, keep the old players out and give more playing time to these guys. Keep Sohaib Malik as one experienced down the order batsmen and that is all we need. Our Bowling unit is strong, we just need to get these young players more playing time. Spectacular innings by Fakhar and Imam. 20 runs away from becoming the fastest to ODI 1000 runs and still has 3 innings to do so. Well done ! Well done Fakhar. Keep it up and hang on tough. Congratulations to Pakistan and Fakhar Zaman. To score double century in odi played overseas is a massive achievement. Excellent! Keep it up team Pakistan. Zim are hardly a good team, but fair play to Fakhar Zaman, you still have to make the runs. He's had a great series. is it too early to say that Pakistan might have found Aamir Sohail and Saeed Anwar in Imam and Fakhar? He is certainly a bright spot in Pakistan cricket. New talent always emerges. @usman too early to say that. Fakhar can be our best opener in a long long time. Cannot say the same about Imam just yet. He has yet to prove against solid squads and consistency. Fakhar has done that already. Fakhar is our future! Records are made to be broken even if they are made against a weakest Zimbabwean cricket team ever, in the history. Well played young man!! yes it was a weak Zimbabwe team but still you have to make the runs. This Pakistani team is looking good with the added bonus of Shoaib Malik they will be serious contenders for the World Cup next year In England. Great!! I wish Pakistan play with Somalia to create a better record. Against current Zimbabwe team even Bumrah have a great chance. Bravo Fakhar Zaman.I know it can be tiring and painful to make such a high score but as someone has said even if it is painful try always to keep it up and hang on tough.Congratulations to the Pakistan Team. A big congrats to zaman for this outstanding performance. Only good things happening for pak cricket ever since Waqar Younis left as coach and Sarfaraz Ahmed came in as captain. Great show by green shirts. Fakhar Zaman is a find of PSL and plays from Lahore qalander. Congrats young man! I wish we could see Pakistan beating India 7-0 (or at least 5-0) in an ODI series against India in India. But of late Pakistanis have been losing to India a lot. I wish Pakistan could continue this terrific form into the upcoming Asia Cup also. Our soldiers are making us proud on duty and on the field. Overall team played very well but Fakhar fight today up to the mark.. i would like to pay heartless congratulation to Pak Team Specially to Fakhar and his Family. You Prove you are the real talent of our country. Opposition is 3rd string team , pak players can win against west indies , zimbabwe and srilanka. "Fakhar" person responsible for India loosing ICC champions trophy. Exciting knock by Pakistani batsmen! Great to see this amazing performance. Good one day and T20 batsman. He fires and the team generally does good. By the way, in all praise of Fakhar one must not forget the contribution of Inam ul Haq who has justified inclusion in the team where some Pakistanis seem to have raised eyebrows on him getting selected due to affiliation with Inzi. Great Inning by Zaman. DElighted to see Pakistan Team is gathering together aginst all odds. Yes great to see our team doing well. However, remember what we do against Australia and South Africa. Excellent work Farkar Zaman!! Pakistan team management please make sure he gets rest and please do not try to include him in the test team. Thank you!! @usman: It is too early. I think, Fakhar and Sharjeel would be good opening pairs for Pakistan but unfortunately Sharjeel is ban until late next year (which I think was unfair punishment, as there is no sign he was involved in corrupt practices). a demonstration of superb focus and utmost commitment. well done!